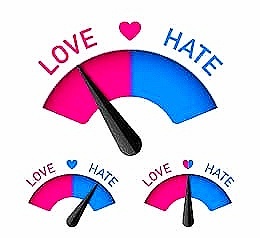 The passivity is the middle path phenomenon ,you try it out when feel enough balancing mindset meter at 90 degree in the activity domain of love and hate meter reading. The major drawback in hate meter reading is the existence of its lower bound contrary to the love meter reading without any upper bound…love and hate are the mathematical equation with bounded conditions , a detailed analysis is needed for each meter reading on a case basis and all the historical aspects are needed to judge the current level of the meter reading falling into which domain/zone i.e. Love or Hate .